Invictus -2014 - Extract from Hybrid (Shine 3' 27") Copyright - ACARD - FITRZYK 2014.... and here we have a brand new release which picks up where "Persecution" left off. With an impressive array of 13 new songs Invictus are ready to take the world by storm once again. "Black Heart" became No1 with the import disk chart in JAPAN ("BURRN ! July issue" ). N°26 in June N°1 in July N°21 in August N°30 in September N°22 of Year 2003. On "Hybrid" : A heavy song with massive groove, high quality sound and very contempory. With an impressive array of 13 new songs Invictus are ready to take the world by storm once again. A heavy song with massive groove, high quality sound and very contempory. Modern and massive groove... Headbangable! Recording : june-december 2012 QUARK Studio, Sound engineer : Fitrzyk Mikael. 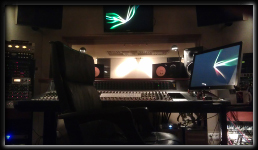 Mix released : Feb. 2013 MII Recording Studio ( Chesneau Didier) : producer & sound engineer. Norman Coast Entertaimnent is a media production company dedicated to helping its clients find creative solutions to their needs in the entertainment and media production fields.